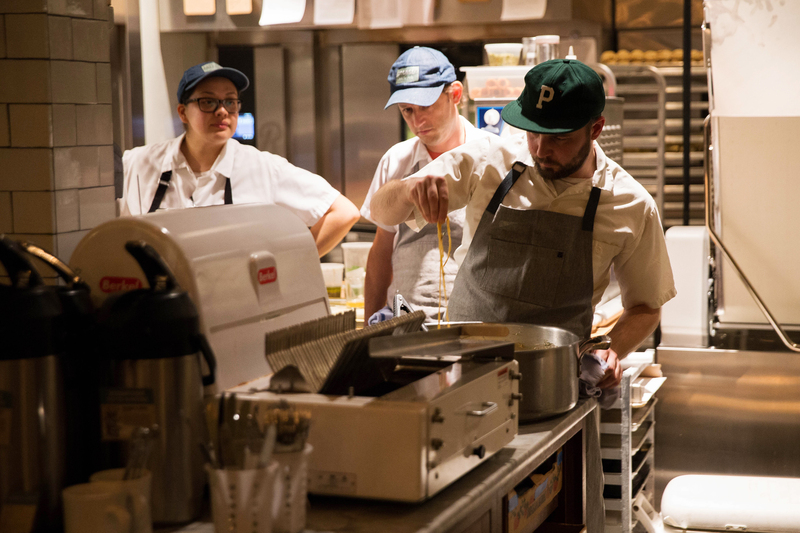 This episode of Portland Food Adventures brings us to Roman Candle, run by Ava Gene’s Chef Joshua McFadden, and tonight featuring special Seattle based chef Ethan Stowell in a Seattle/Portland mashup to be remembered. 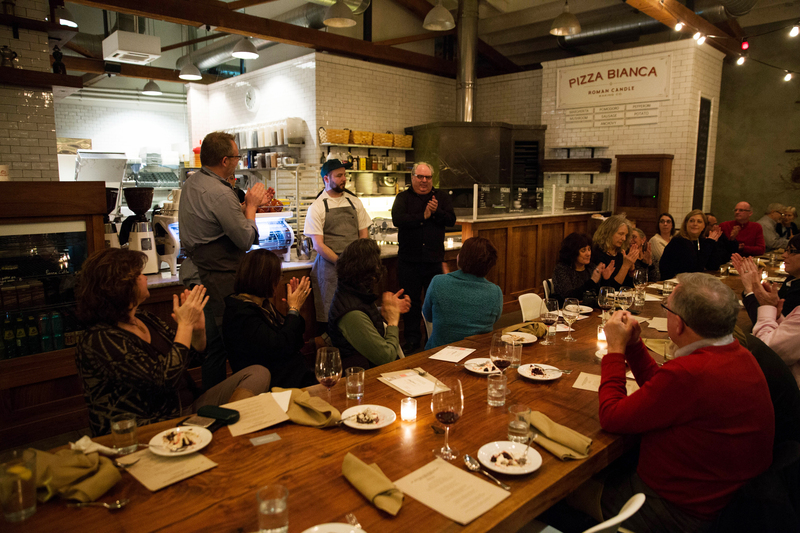 Chef Stowell is reknown in the food community with several James Beard awards and 10 Seattle based restaurants, while Chef McFadden has created a staple in the Portland fine dining scene with Ava Gene’s and Roman Candle Baking Company. 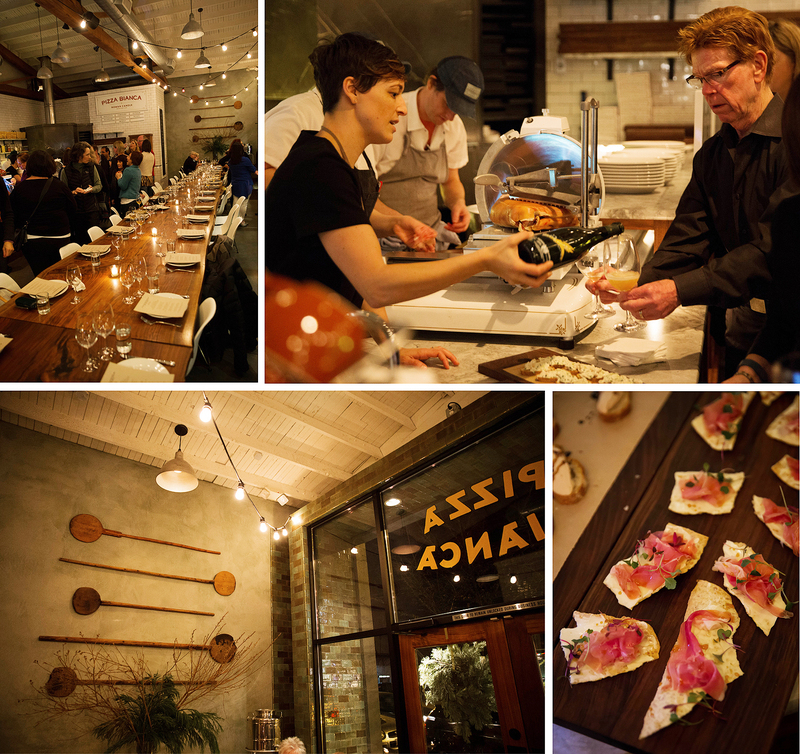 We were presented with several appetizers for our first course, including a smoked black cod on crostini, foie gras with aged balsamic, gnocco fritto with prosciutto and persimmon, as well as multiple wine options. 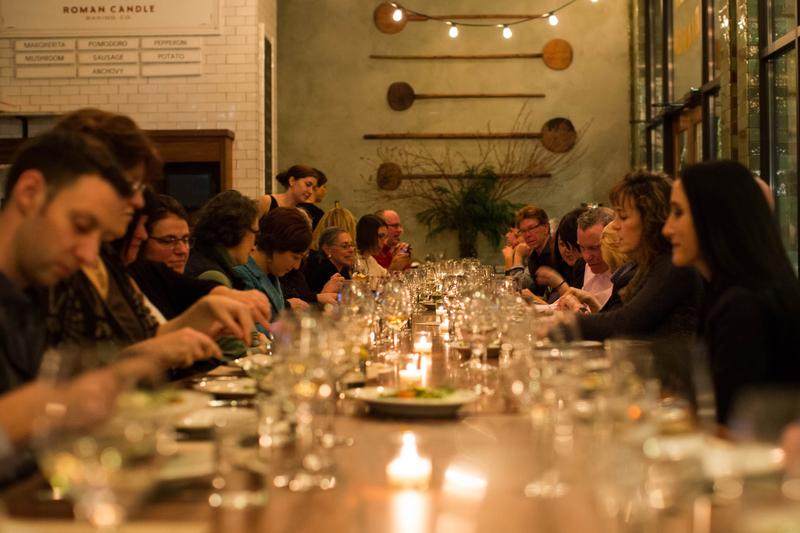 The Roman Candle space is beautifully decorated and held our 40+ guests quite well in one large, rustic wooden table. 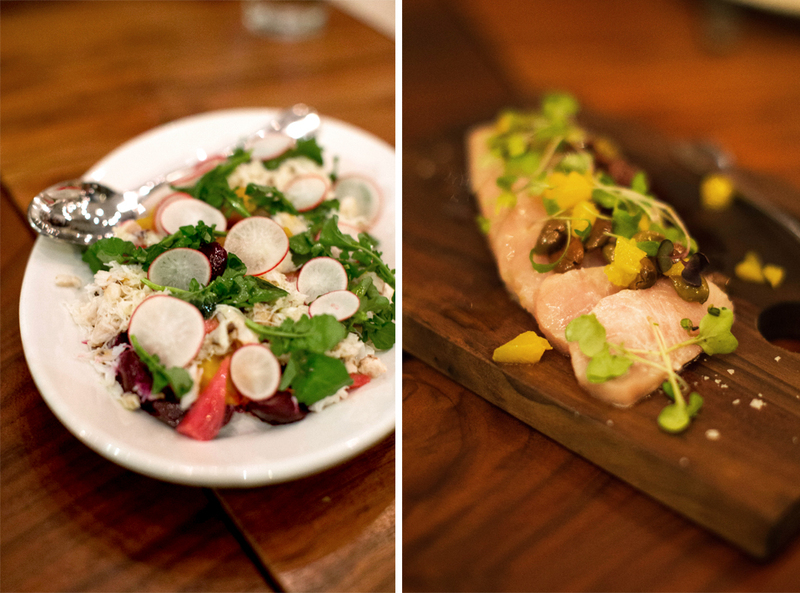 Our first main course was a seafood trio, with stellar bay oysters (not pictured as the guests got to them before I did) Hamachi crudo with olives and orange, and a baby beet and Dungeness crab salad. 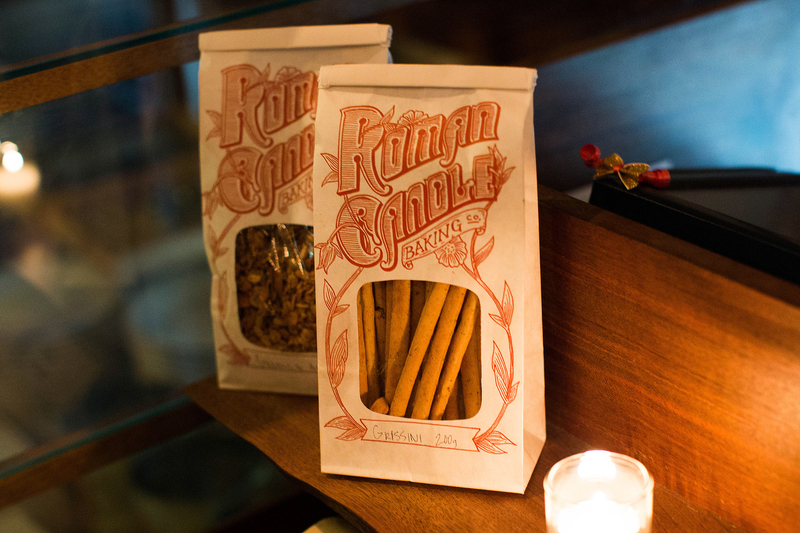 Roman Candle Baking also provides many packaged baked goods, like seen below. Chef’s Stowell and McFadden (left and right above, respectively) came out of the kitchen to talk a bit about the night’s menu. 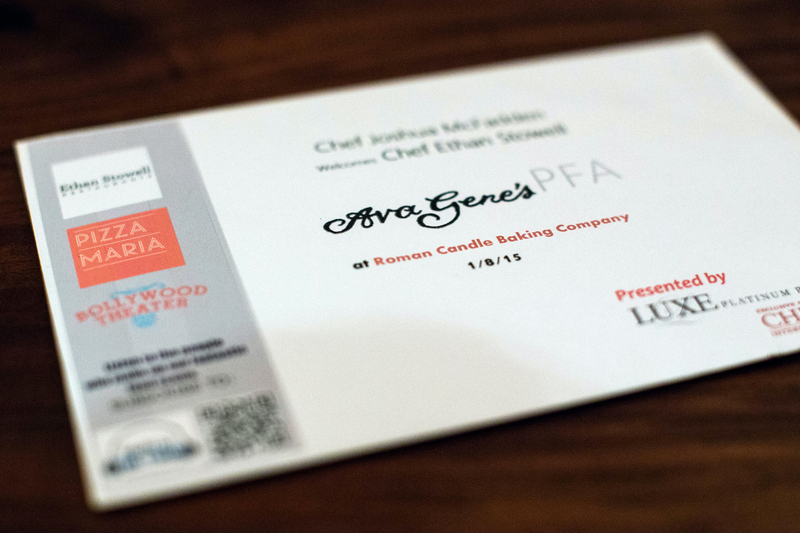 It provided us with an interesting fusion of both chefs, and included a couple of Ava Gene’s signature dishes as well. The wine pairings were also an important part of the evening, using only specialty Italian wines. With many restuarants in the Portland area featuring locally produced wines, they decided to focus on creating an Italian import only wine list, as Italian wines provide great variety. Above were our next three dishes for our 3rd course, a sampling of salads all with a pretty unique twist. 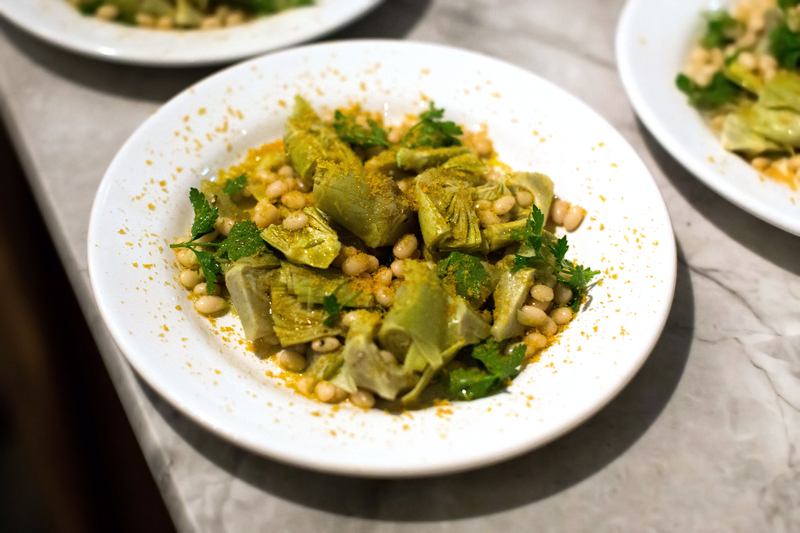 The top being artichoke and controne beans, under to the left a pumpkin ‘pasta’ of sorts with brown butter, currants and pecans, and finally citrus and avocado with burrata. The Chefs maintained a great presence throughout the evening, and while I don’t quite remember the context of the picture it sums up the atmosphere quite nicely. Below our Chef in the kitchen hard at work, I managed to sneak a shot from the dining room. The kitchen and dining area blend together nicely, creating an open and inviting experience. Above was undoubtedly my favorite dish of the night, a potato gnocchi with rabbit ragu, oregano and mint. 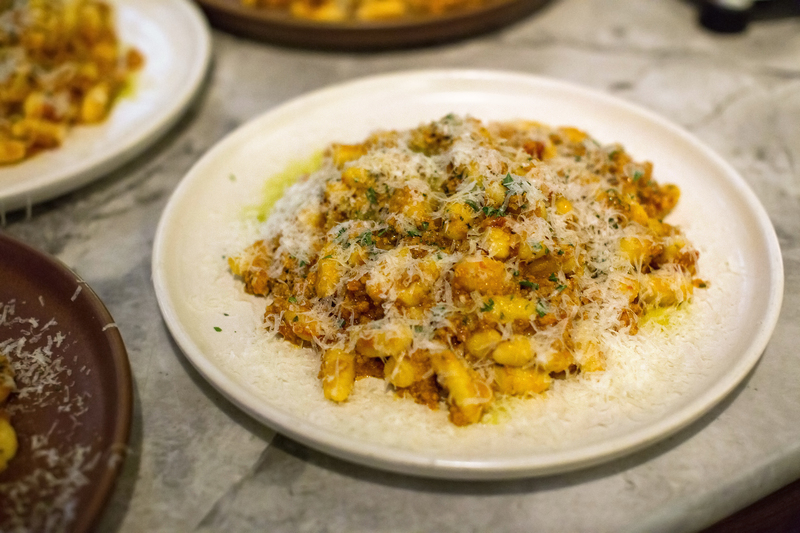 I rarely have rabbit or gnocchi outside of these events, and this one did not disappoint. Below was the tagliatelle with Dungeness crab in a faux ‘alfredo’ sauce. Above was our final main course, an eye of ribeye with anchovy, caper and lemon topping, served along a flint polenta with parmigiano reggiano which was incredibly hearty, expertly cooked and all around delicious. 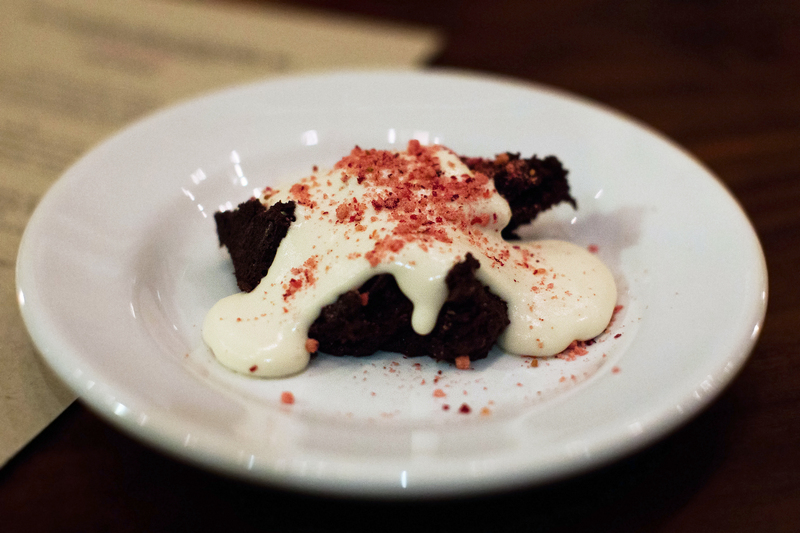 Our final dessert course was a rich ‘chocolate nemesis’ with malted cream and cranberry crumbs, served along a non-traditional dessert wine, Cabanon “Vino del Bosco”. 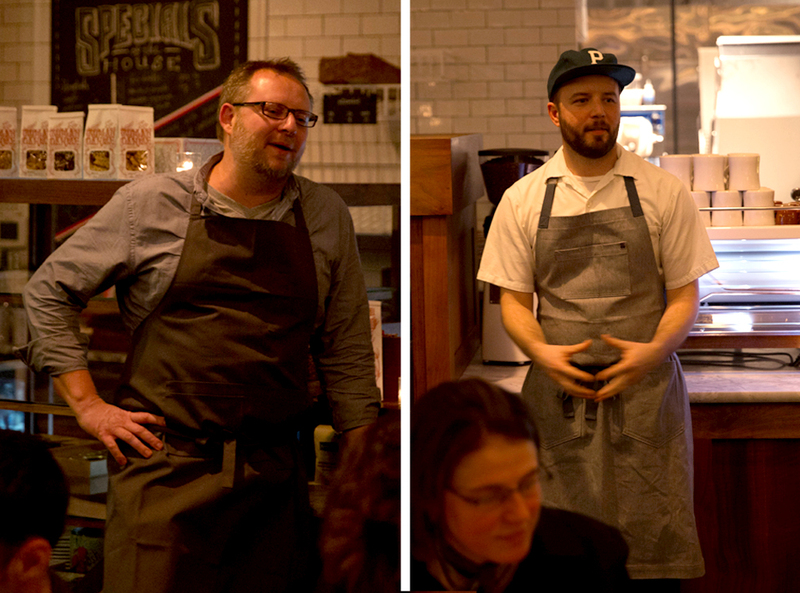 And finally our chefs and host, Chris Angelus, talked a bit about the gift certificates provided that night. First off was a card to any of Ethan Stowell’s Seattle restaurants (great reason for a road trip!) 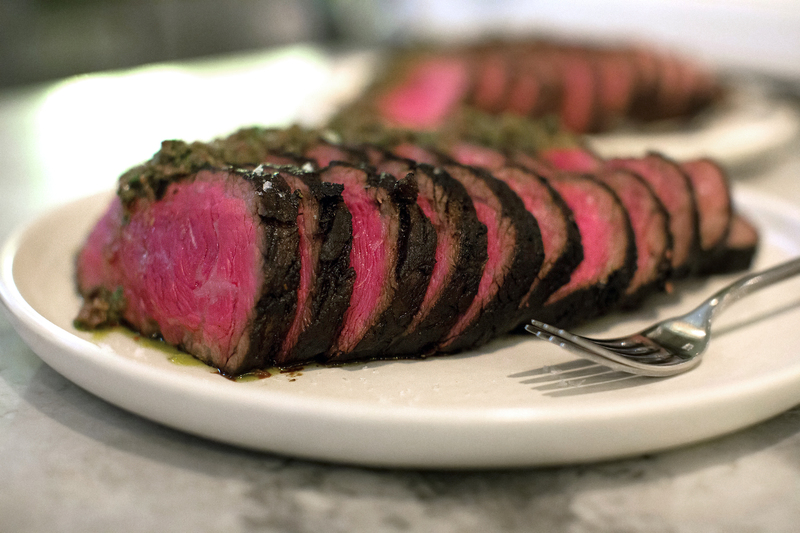 alongside Bollywood Theatre (Which Chef McFadden admitted to dining at several times a week) as well as Pizza Maria. Thank you to all the guests, Chefs Josh McFadden and Ethan Stowell, as well as the lovely staff of Roman Candle for providing a lovely evening and unique dining experience. 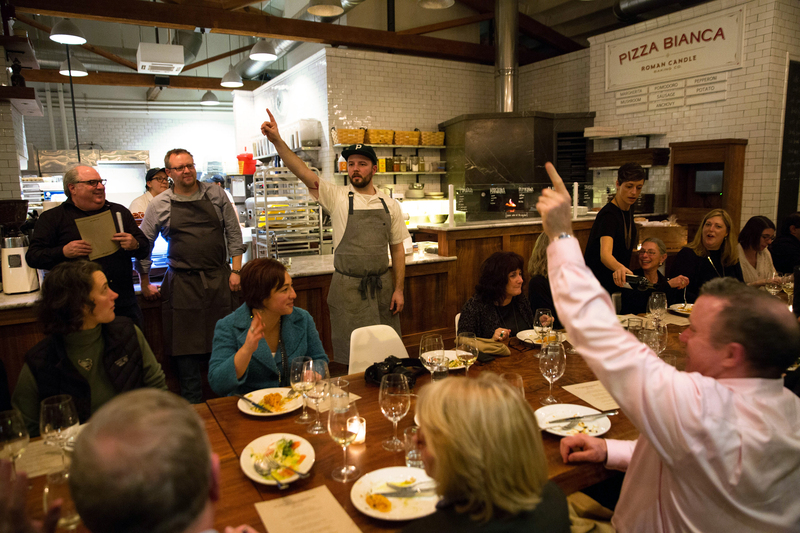 Stay tuned for future Portland Food Adventure events!